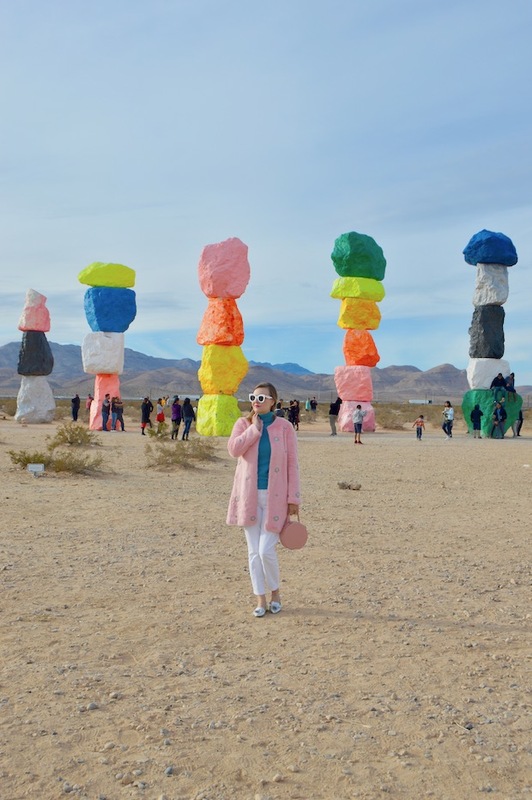 On the way to Vegas, you really must stop at the Seven Magic Mountains installation, which is just a few minutes off of the freeway! This is actually my second visit to these crazy, colorful rocks. On my second visit, I was excited because I thought that maybe, after over a year, the crowds might have lessened a little bit. Also, we traveled to Vegas after the New Year, when most people are back to work, so, again, I thought that was another factor that might reduce crowd size. Well, I was wrong and it was just as crazy and crowded as ever! As always, I came prepared for the occasion in an outfit to match! I just recently bought this pink furry jacket on clearance at Zara. 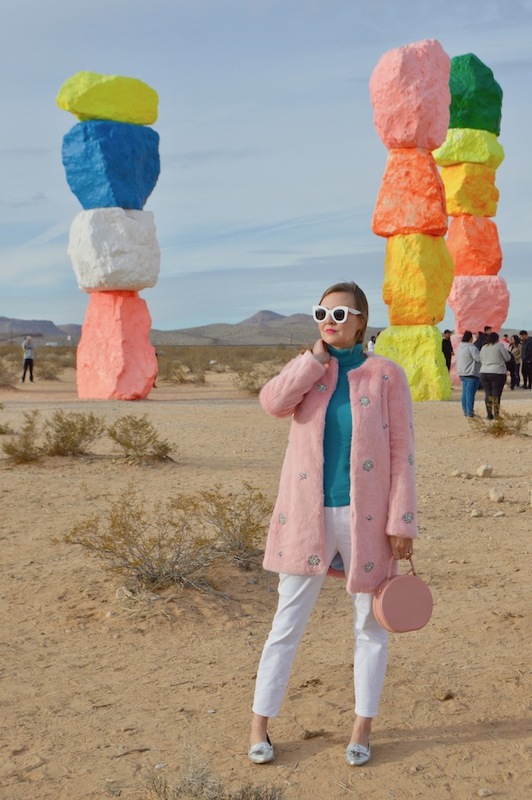 It was too hot in Los Angeles to wear it, but it was just perfect for the coolor desert temps of Las Vegas in winter. It's also a little reminiscent of Liberace, so it really is perfect for Las Vegas! Due to the swarming crowds, it was difficult to get a clean shot of just me and the "mountains"; people seem to pop out from behind the rocks without notice, so just when you think you're getting the perfect shot, it is photobombed in an instant! 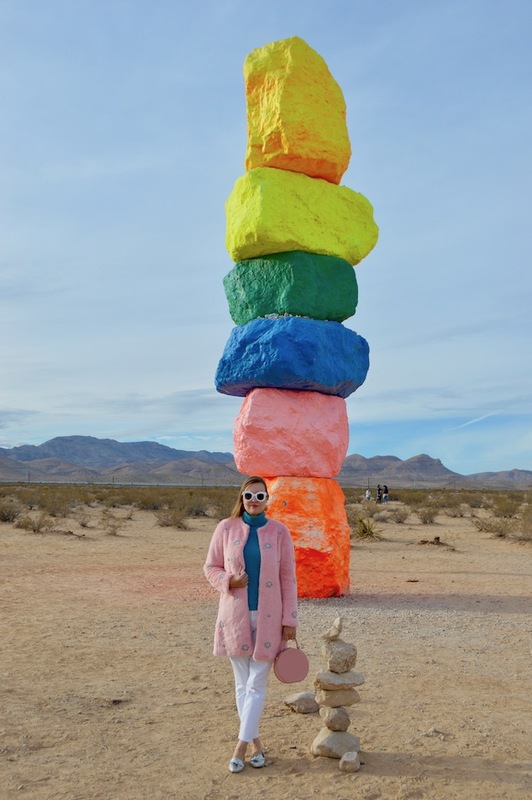 Also, I always wonder why people don't dress more colorfully when visiting these rocks! I think I was almost the only person there who had something other than black on, which actually made me realize that most people wear black on a pretty regular basis! I guess color isn't for everyone but it does make life a little bit more fun! In all fairness, though, I am sure some people were wondering why I was wearing I gigantic, pink furry jacket with rhinestone embellishments! Liberace chic! 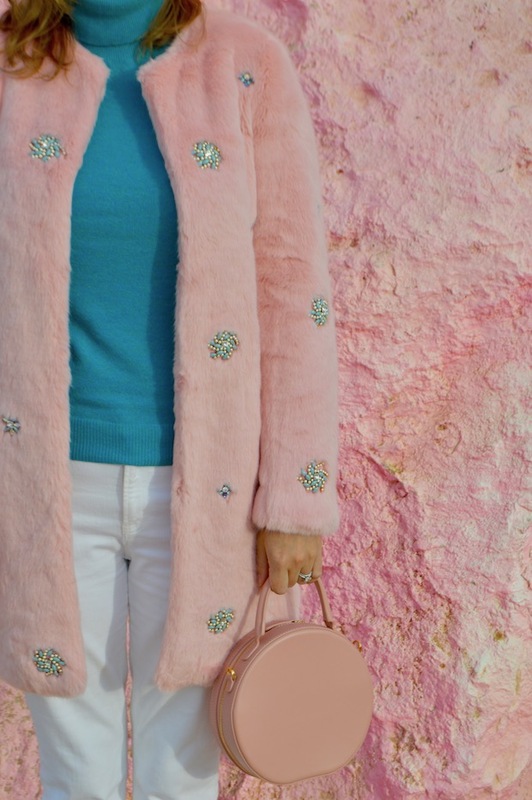 It is funny to see everyone in the neutrals in the background behind you, and you in your furry pink coat! Love it with the matching bag. Hope you had fun in Vegas! I am seriously drooling over your coat! SO beautiful. Love these photos too! Okay that coat is absolutely stunning. I loved seeing it on your instagram and even more so in these pictures. You look gorgeous!